Those who wish to understand the values held by the Bucklin family before and during the American Revolution should understand some history of the area of the historical roots of the Bucklin family, specifically: southern Dorset County of England, and the towns of Dorchester, Weymouth, Radipole, and Buckland-Ripers. When you understand this bit of English history, you will understand why it might be expected that William Bucklin brought with him to New England the skill of a shipwright, and that the first generations of Bucklins were connected to the sea, were more interested in merchant trade than farming, were evading paying English customs taxes “normal”, and were Protestants (Baptists and Quakers), not Church of England or Catholic. In the 17th century Dorchester had three major summer fairs, an unusual number compared to other “fair” cities. This was probably because Dorchester was a center of the English cloth industry, with perhaps more sheep than any other area of similar size. Through the nearby port of Weymouth, Dorchester’s merchants traded wool busily with the continent. The wool trade and woolen cloth trade was so important to England that in the 14th century, the Woolsack was introduced as the seat of the Lord Speaker in the House of Lords, the Upper House of the Parliament. It is a large sack stuffed with wool as a symbol of the prosperity of the realm. In short, as a trading and shipping center, Dorchester in the 17th century had top importance in Dorset, and it had importance in the country of England. The history of the county of Dorset as a prime place of trade with France and Europe made Dorset residents resent any attempts by the King to prevent trade with France, or to tax trade with the continent. Dorset men were common as merchant traders, ship owners, and masters and sailors in English merchant ships, and Dorset men on land were often smugglers. The route from the Norman area of France to the Dorset coast near Weymouth was short enough to be quickly traversed, but involved a large enough area that evasion by smugglers of patrolling ships was practical. (Indeed, this is why Weymouth was the place from which the United States launched its invasion of German-occupied France during World War II.) Furthermore, Normandy was the area from which the William of Normandy had brought his army to conquer England and settle it with his followers. 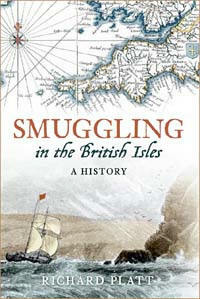 Thus, Normandy and Dorset had not only business connections, but also family connections which aided both trade and smuggling. As to religion, Dorchester’s fervent Protestantism (versus Catholicism) in the 17th century is best described in David Underdown’s book, Fire from Heaven (London, Yale Univ. Press, 1992. This is a detailed and delightful history of the people of Dorchester and their transformation of Dorchester in the 1600’s to make it the most Puritan town in England. As we mentioned, in the 17th and 18th centuries, Weymouth was an important port city of England. Weymouth, as the name implies, lies at the mouth of the Wey river. But in Roman times, the Wey river entered the sea further upstream, at the tidal river site of what is now known as Radipole. The source of the River Wey is a springs area at the foot of a chalk ridge above (north of) Upwey, and flows through the village of Upwey. The source is known as the Upwey Wishing Well and was a tourist attraction as far back as the Victorian era. There is a pleasant tea room at the site, complete with garden. In the 18th century a water mill was built on the river (featured in Thomas Hardy’s The Trumpet Major). The village has a 13th century parish church and a manor house, Upwey Manor. As a side note, William Sprague (1609–1675) of Upwey had parallel life experiences to William Bucklin, inasmuch as both left England for New England at about the same time, both had grants of land in Hingham, Massachusetts, both moved to Rhode Island (where two Sprague became governors of the state of Rhode Island), and the Sprague and Bucklin families had several intermarriages. Radipole in early England was called “Wey” because it stood at the head of the lake into which the River Wey flows. The village takes its present name from the lake now known as Radipole Lake. The oral history of the Bucklin family contains the reference that William Bucklin “came from Wey and was a shipwright.” That probably is a reference to the present village of Radipole. 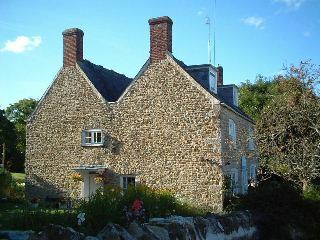 It is at Radipole that the Causeway House exists. Causeway House dates in part from Tudor times when it was the house of Andrew Buckler. This was the house of the former Manor of Causeway, and probably an ancestral house of the family of William Bucklin. The picture on the left is courtesy of http://www.radipole-dorset.co.uk/index.html the official site of Radipole, and a site which you should investigate to see the charm and history of the village. Mrs. Margaret Clary, a long-time owner of the manor house at Buckland – Ripers and a student of local history insisted during her lifetime that during the 16th and 17th century the local pronunciation of “Bucklin” and “Buckler” would have been indistinguishable, and that the Buckler Causeway House could well have been the home of “Bucklin”. Again this fits with the oral history of the Bucklin family which contains the reference that there is in “Wey” a family plot of graves centered on an upright shaft of stone. Lo, in the church graveyards of the Weymouth area, only one plot of graves fits the description, and it turns out to be a plot containing “Buckler” graves associated with persons with appropriate substance and standing to be associated with a Tudor house of this dimension. There is some evidence of prehistoric occupation, and of a Roman small port or landing stage at the tidal river site of Radipole. A Romano-British burial site is also there at what was the head of the tidal lake at what was then the mouth of the Wey river. Radipole is a part of the district of Weymouth and Portland in the county of Dorset. It was formerly an independent parish, until abolished as a separate local government unit in 1933. It remains a separate ecclesiastical parish.